Swedish-Scotland pilot project developing a new framework for supervision for child and youth care homes. Visit to Care Inspectorate Scotland to get aquitance with new developments and to discuss the possible co-operation (4-6 December 2017). 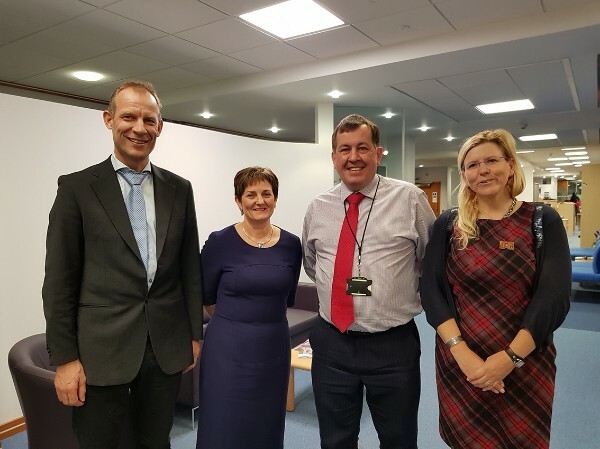 Klas Öberg, Research and Project leader (IVO), Karen Reid, Chief Executive (CI), Kevin Mitchell, Executive Director of Scrutiny and Assurance (CI), Mari Murel, Reasearch and Policy officer (EPSO). The project includes an environmental perspective on risk and quality in care homes, both in Sweden and abroad. The investigators Anna Öström and Ann-Christine Pettersson are the project leaders of this pilot project and on the 16th of April they will attend the EPSO Risk working group to present and discuss their current pilot project.